These Wilton 609-105 FoodWriter extra fine tip edible markers can be used like ink markers to create precise letters, lines, and drawings on custom cakes or cupcakes! Easy to use, these markers help save time and reduce food costs while adding bold colors to your baked goods. Each pack comes with an assortment of colors, including black, green, blue, red, and brown. The color variety will help you create imaginative designs without needing to use multiple pastry tubes and icing colors. I’ve used these for tons of different cake and cookie decorating projects. Ive used stencils to get precision lines and then piped over them. Great for text too! These were ordered to write on bananas for a promotion we are doing for students. They are great!! I would recommend them to someone else. We use edible markers all of the time in our cake shop! These work great. We go through them often and have ordered these numerous times! 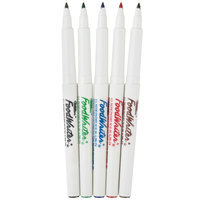 These markers are great for writing on fondant or cookies. You can also write on hardened chocolate. I love how there are 5 different colors. These markers are fantastic for cake decorating. They make little things in terms of decorating easier and are easy and fun to use. Great price too. Wilton Extra Fine tip food writers are perfect for writing on dry royal icing. They also are great to plan out designs on blank cookies. Easy to use and a great price. These Wilton Food Writers have a nice fine tip making them perfect for doing accents on cookies and cakes. I like the variety of colors too. You can’t go wrong with anything Wilton! These edible food writers allowed me to step my game up when decorating cakes/cupcakes and cookies. They work perfectly on fondant pieces once dried and dry. I could not recommend these things enough! It saves me a ton of time when adding details to cookies or fondant decorations. I'd used these over piping any day. I like that they have a narrow and fine tip to them. I use these directly on the cookie to help outline how I'm going to decorate them. Only 3 of them worked well. While color doesn't matter, it would still be nice to get the most out of the pens. The Wilton extra fine tip markers are awesome and make a great tool for decorating our sweets. We love to use them to decorate our dipped apples with cool, seasonal designs. The Wilton food writer colored markers work well with fondant. I was able to get the lettering fully black without going over it too many times. This 5 pack of Wilton extra fine tip edible accent color markers is really convent. The colors are true to their shade. I would buy again. The Wilton food writer extra fine tip edible accent color markers are excellent and make a great tool for decorating our cookies and cakes. The markers are excellent and work perfectly. I love these markers for food writing! The extra fine tip allows me to do very detailed drawings on fondant. I wish there were more colors! Great product. The Wilton extra fine tip markers are awesome, and I think its so cool I can write on my cookies and then eat the. Great for creating fine detail on the cookies. Amazing product ! So fun to use , even my younger kids love these! Who would ever thought you can teach kids to write and they get to play with there food! When you need intricate details on fondant, gumpaste or cookies this is what you need! Makes drawing those intricate lines so easy! I could not pipe the grinch face with frosting but was able to draw it with these handy food markers! I use these to trace designs onto cookies before decorating with royal icing or for those fine details that would be hard to pipe on like eye lashes. Amazing!!! I love the fine tip. I am able to do several details on cakes, cupcake toppers and cookies. Bought them a while ago and they still work as brand new. Super recommended. The fine tips on these are perfect for fine details. The color didn’t bleed at all when I used them to write on gumpaste. They have zero odor, yet the colors are very well pigmented and buildable. A great decorating tool that is a really great price. It is perfect for decorating cupcakes and cookies. The extra fine tip markers are great for fine details on decorating cookies. I love this extra fine tip edible accent color markers. They making adding fine detail on sugar cookies and fondant cakes a breeze. The markers have a great bold color and apply on really easy. I will always keep these on hand. I use these food markers to write on sugar cookies that have been iced with royal icing or fondant. If you want to write on fondant, you need to let it dry for a while otherwise the markers just end up poking holes in the fondant. Also, you can use these to sketch out your cookie design before you decorate your cookies with royal icing. These color markers are edible and allow our cake decorators to take their skills to an entirely new level. Adding unique drawings right on a cake covered in fondant is a nice way to offer something different to customers. These Wilton 609-105 FoodWriter Extra Fine Tip Edible Accent Color Markers are great for decorating cookies, the extra fine tip works better then the others that are out there. These are so wonderful & easy to use. I especially love that they are fine tip pens so I can get percise lines when I'm writing on my macarons. Nice detail optoins for food or for face and body coloring fun as they are safe and edible so they work well for that too! have fun and be creative! These markers are great. I use them on fondant and gum paste. They are fine tipped and write very smooth and consistent. Also love that there is brown in this pack which is something you don't see too often. Be careful not to write too hard on soft fondant it will poke a hole in it. Best to let fondant sit out for 10-15 minutes. The fine tipped ones are a must for small and delicate treats. These are good for creating you own valentine heart treats and much more. I LOVE THESE! They are so nice when you need to get fine detail on fondant. The tips are extra fine just like they say. I highly recommend these if you do a lot of fondant work. Love the assorted colours and fine point tip. Writes great and are perfect for writing or drawing when brushes are too big. Will recommend to others. These are an absolute excellent value, especially if youve priced these elsewhere.. Have used them often, and they do a great job - without breaking my bank! These got here just in time for an order I had today and I was blown away by the quality. I've bought Wilton markers before and had been dissatisfied with the quality...they would not write smoothly or last long. These worked just like the more expensive ones I've had to order from other suppliers. Perfectly smooth and clean lines...I really hope they last a while though. I really like the extra fine tip on these wilton food markers. I use them when making small fondant or gumpaste plaques for my cakes. They make it very easy to hand write on the plaque rather than trying to paint it on. Used these to mark stuffed baked good item so we were assured of the content. I wish they would produce a set for baking items in the oven exclusively, but these do the trick. I love this product. The fine tips allow you to write or draw small details on your cakes, cupcakes, and other desserts, and the colors are very vivid. I have tried other edible ink markers and they work fine for a bit but tend to dry out quickly. I have not had that problem with the Wilton markers. I especially love this Extra Fine Tip for writing on my royal icing decorated cookies. They are great for adding tiny details to eyes and for writing text. The fine tip is great, but my brown marker stopped working pretty quickly, though it's possible the surface was not yet completely dry and it affected the marker. I also received a pack with two blues and no black, which is problematic as black is the color I anticipate needing most. Thank you for the review! We're sorry to hear your order was missing a marker. A Customer Solutions Representative will contact you right away. Decent fine tipped markers. They work nicely on super dry fondant and sugar/rice/wafer paper. Not so much on royal icing cookies. Your drawings will stay on the icing well but won't look as pretty as it does on the fondant and rice paper.